Why is a house cleansing a good idea? Perhaps you have just moved into a new home and notice an old stale feeling or the lingering energy of the previous owners. Even new construction will have energies from the building crew. There may possibly be a feeling of another presence and the energy may feel heavy, dark and lethargic with a sense of negativity present. 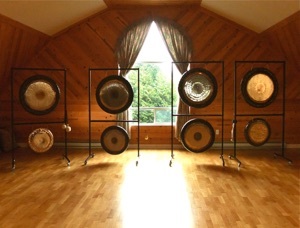 The vibrations from the gongs penetrate the entire structure of the home, walls, ceiling, floors, wiring and plumbing. Basically leaving no stone unturned, they are clearing stagnant and heavy energy. This brings the home environment back to a clean balanced life force and allows wellness, abundance, and harmony to flow. What happens during the House Cleansing/Blessing Ceremony? The whole ceremony lasts approximately 2hrs. sometimes longer. The focus is on the house, the home owner is encouraged to invite family & friends. Then the cleansing of the energies that maybe stagnate, heavy or foreign. Followed by filling the the newly cleaned space with high level vital energy and balance. Last the personal blessing, which comes directly from the home owner and the people present. Each person is asked to step up to the gongs express their prayer/desire for the space and then anchor that energy by Striking or playing the gongs. Plus Paul asks for a small potluck style snack be available at the end. Paul usually does not eat on the day he does ceremony till after the ceremony is complete.